I recently made a mistake when I tried to “save money”. A few weeks ago, I traveled to Chicago for a small business education class with other kitchen and bath design companies to learn techniques to run Design Set Match more efficiently. Not being a frequent flier, I simply did what has worked well for me in the past. I went to one of the travel websites and then a couple of others to discover that they’ve been bought up by the same company and are essentially all the same site now. Ok, so I didn’t see as much variety as I have before, but the rates looked reasonable. The trouble is what I didn’t see coming. I booked a cheap flight on a “young” airline. I’ve done this before without any trouble from other airlines. Sure, I usually sit towards the back in economy, but that's not a big deal, I almost always get a window seat. Then I went on to select my hotel room. It was a little more than the cheap hotels, but it was within walking distance to the Häfele showroom where the training classes were to take place. I even upgraded because I didn’t want to be in a “dorm style room”. I felt good, paid for the trip, and was all set. Not so fast, I immediately got an email from the airline about their “bare fare” to discover that they charge extra for everything! Ok, so I need to pay for a meal, that's pretty typical, I prefer the airport restaurants… wait, now I need pay for my carry-on luggage too, it's a basic essential for a 4-night 5-day trip! So I fork it over… select a seat? Forget that, it is additional money for even the farthest back seat! If I was flying with my family I would have needed to do it though (to be able to sit together), so I opted for a “random” seat. There’s more… or I should say less. They don’t even provide the most basic human necessity of water on this 4.5 hour flight without charging for it! And just to grind in the nickel-and-dime insult they have billboard advertisements on the interior walls and they have a long-winded flight attendant trying to “sell” their MasterCard at the end of the flight to get a discount on the food they just charged an arm and a leg for! Ok, rant over. What does this mean for remodeling? What can a homeowner like yourself take away from this? Learn from my mistake. Ask questions. When a contractor, cabinet company or plumbing shop says they can do your kitchen for less what does “less” mean? What are they removing to make it a “bare fare” like my flight? Often with cabinets they haven’t paid attention to the details of functions that have been painstakingly poured over by you and your kitchen or bath designer. Homeowners in the San Francisco Bay Area trust me as their kitchen and bath designer to review their orders before they spend $20,000+ on cabinetry or $150,000+ on their remodel. I often find that from the outside cabinets or other items “look the same”. What they’re actually being sold isn’t a solution to the problems that brought them into me in the first place. Lower cost cabinets usually function like their 1960’s cabinets do now. My clients will continue to lose pantry items in the back of the corner cabinet or deep pantry only to discover them years after they’ve expired. Or they’d be purchasing plumbing fixtures like a Toto wall-mounted toilet with the Geberit in-wall tank through an online retailer only to discover their plumber hasn’t installed one before and needs to spend hours on the phone with customer service because he thinks its “broken” and he can’t get a local manufacturer’s representative to talk him through the process which will prevent leaks in your walls. And worst of all is getting a general contractor who doesn’t meet expectations. They usually are unlicensed, have poor communication during construction, draw out construction longer than expected (even if there are no unforeseen circumstances) are careless with other rooms of your home and nickel-and-dime you because “they didn’t plan to install crown moulding” or the “wall-mounted toilet took more time to install than I had planned”. Homeowner beware. Ask questions, get detailed written agreements spelling out what will actually be done, get a written construction schedule. 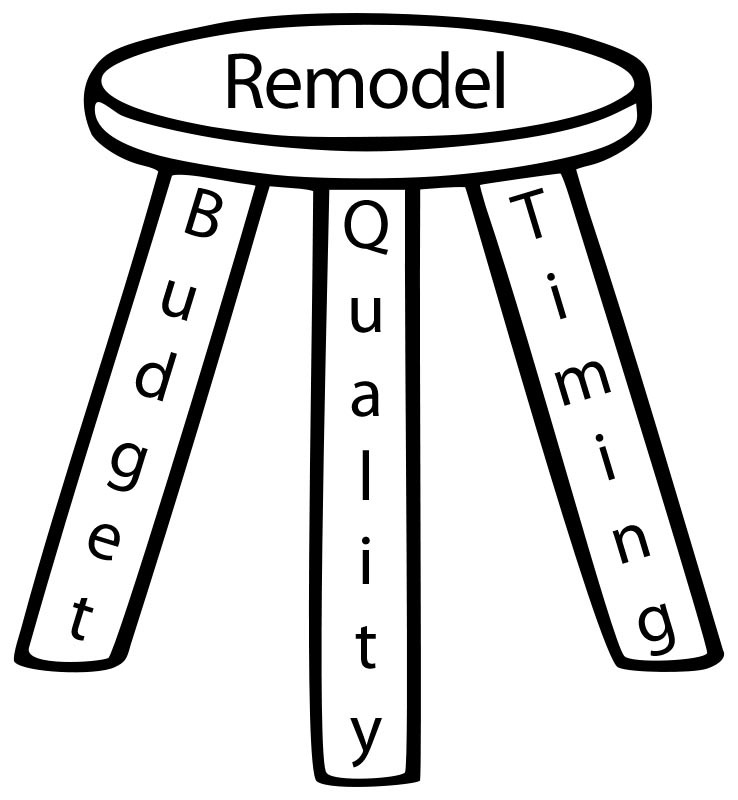 It's worth the savings in valuable time and stress to pay a little more for the proper management and quality materials your trusted remodeling professionals will provide. There's a difference between "frugal" and "cheap". Don’t make a “cheap” mistake of your own. "Now Everybody is in the Bathroom!" In my 2 bedroom home this statement is a daily exclamation from my 4 year old daughter. My daughter encroaches on my privacy with her fingers and her toes, and sometimes our kitty joins in by waving her tail under too! As a mom of a small child this is not unexpected, you may have seen the images floating across Facebook and Pintrest of a child's hands poking under a bathroom door when their mom or dad is wanting just a little privacy in he bathroom for even two minutes. Unfortunately, I don't believe there is a real practical solution to this world-wide problem other than to wait-it-out and teach them patience until you're an empty nester. It is also unsurprising as a family living in a small space where everyone is getting up around the same time. Sure, we've learned to work around each other. I take my shower first, my husband gets his coffee and the little one dilly-dallies, looks at books, plays with our kitty or attempts to play Candy Land on her own. But there is inevitably a point in our morning where we just can't not be in each other's space. Daddy is in the shower, the kiddo has finally agreed or has been coherced into having her teeth and hair brushed while I finish doing my routine, and of course as she doesn't want to be left out, Kitty joins us as an additional bathroom rug just as daddy is stepping out from the shower. That's three humans and one kitty in a standing space no bigger than 2.5 x 3 feet! My morning experience isn't uncommon in the Bay Area. Many homes in Alameda, Berkeley, Oakland, Marin and San Francisco have the same problem, too little bathroom! Surprisingly some larger homes have this as well! Occasionally they may have a powder room to reduce the wait time to use a toilet, but more often than not, single family homes were designed with single bathroom facilities. Unlike older kitchens without space designed for a refrigerator that I've mentioned in a previous article, I have trouble seeing the logic of the architects and builders after the 1906 earthquake. Bathrooms were a common requirement, the day of the outdoor privy and use of a bed pan for a servant to empty out were gone. I'm speculating, but maybe people simply thought they were still a convienience or a nice-to-have rather than a necessity? Move out during the construction time by renting a second home or apartment, going on vacation or staying with family. While this is ideal to keep you from breathing construction dust it is typically unrealistic to many new and retired homeowners financially speaking. Live in your home during construction. While living in your home during is the most cost effective, it can increase construction costs when your general contractor needs to uninstall and reinstall a toilet every day so that you're not making nightly trips to a porta-potty. Or you don't have a gym membership or a friend who is generous enough to let you use their shower each day and so your contractor needs to do a little more work to set-up and take-down a temporary shower which takes time away from their duties in completing the remodel a few days or weeks more quickly. Its also easier to be frustraited with daily life in a construction zone, there is dust everywhere even in places where you're not remodeling, if you work from home the noise levels can be so much that you buy a huge pair of noise canceling ear muffs that don't even double as a music headset and most people naturally tend to feel like they need to micro manage the work crews which simply adds to everyone's stress levels. How can I add a second bathroom to my home without changing the overall footprint to keep my costs reasonable and not need to go through a long process to get my neighbor's approval? In the last few months this has come up and the best solutions have been to absorb another space. Maybe it's a closet, a small office or dressing room or even a second kitchen that was added 30-40 years ago to accommodate student renters near CAL in Berkeley or SF State. Usually the space that needs to be absorbed requires a small sacrifice to get rid of unused items, you may increase your budget slightly to rework a closet in another area for better storage or you simply start to think differently about how you use your home and plan to make changes to your daily routine. Often this question comes up when someone is thinking of selling their home in a year or two. If this is the case its often not worth the stress or expense on your life, leave it to the next buyer. It is better to maintain and upgrade your current bathroom to be appealing than it is to do something with the assumption that someone else will "appreciate" your hardwork. How many people use your bathroom? What challenges do you have to work around each other? And what would an investment to add another bathroom be worth to your life not just the resale value of your home? One experience that makes me unique in the remodeling and design community is my time designing homes as an employee of Winans Construction Inc, a Design Build company out of Oakland, CA. Past National NARI (National Association of the Remodeling Industry) President and SFBA NARI (San Francisco Bay Area) chapter presidents, Paul Winans & his very organized wife Nina have since retired remodeling homes, but their legacy lives on as they continue to come along side professional contractors via and Remodelers Advantage, training them how to serve their clients with the highest integrity. Why is this unusual? Most Architects and Designers have very little hands-on experience with the designs they create. Now while I wasn't hammering nails or pouring concrete, I was present and available for answering questions about oddities that might come up such as framing being in the way that prevents the recessed light fixture or the shower valve and controls to be installed correctly. I was there to look for fine details and relationships, in tile placement and alignment for example. Keeping the completed project in mind so that in the end there were fewer items on the "final punch list" and no major do-over installation work to allow the homeowners to move back in on time. Now as an independent kitchen and bath designer through Design Set Match I'm not a general contractor, but I do continue to offer the detailed focus that is necessary for a successful remodel. I like to work with general contractors who truly follow a team approach, who keep a detailed schedule of the project and who plan everything out as much as possible before starting construction. The team approach starts with Schematic Design. The Schematic Design phase gives me an opportunity to get to know you and your home better and I often connect homeowners with a couple of general contractors who truly care and value the new design you've work so hard come up with. I will have measured and drawn your existing rooms and created a couple of remodeled alternate options in my computer. During that time, I encourage my clients to connect with contractors, and as I’ve mentioned before in my article “Do I Really Need Three Bids?” have initial conversations and possibly get a ballpark cost (not a bid). Use this time to interview and narrow down your choices for whom you might want to work with. If you have already selected your contractor that's great! I'd like to invite them to our appointment to review the schematic designs. In the Design Process and Construction Preparation phases, our next steps will include selecting the materials you will actually use in your kitchen or bathroom. While the contractor generally isn't involved much here, I will be providing them with a detailed list of materials, quotes and data/specification sheets so we can discuss possible concerns early. I like to go to your home to walk through the project with the contractor and their trade contractors. Occasionally there is a concern for the electrical load on the existing wiring and coordinating with PG&E, or reusing fresh water plumbing supply lines and the plumber may recommend bringing a new supply line from the main at the street. Having these conversations now sets up expectations and reduces stressful and costly unforeseen circumstances after construction has started. This also provides your contractor with accurate information so they can provide you with a fixed price contract, as I've recommended before in "Decisions and Consequences". All to often homeowners are suckered by the "lowest bid" only to realize that the “allowances” the contractor provided were far from realistic and end up costing thousands more than what they had expected. During construction the contractor is "in charge" of managing their team, but I schedule site visits to see and help understand specific aspects. Much as I did while working on the Winans Construction team, I act as a guide who focuses on the end of the project while answering homeowner and contractor questions regarding framing, electrical, plumbing and tile layout. Unfortunately this can break down when contractors are not organized with their schedules, are poor communicators and don't return phone calls or emails in a timely manner. I try to eliminate this as much as possible by reaching out to them often and working with them earlier in the process rather than later so that we have built a relationship on trust and mutual respect especially if we haven't worked together before. My goal is not to push any contractor under a bus, nor is it to be pushed. It is to create a beautiful new space for you to live in happily for years. Pointing fingers and passing blame is not my objective. Let's work together to design and build your home in away that is satisfying to everyone on the team especially you. This is a tough question. Probably one of the most difficult that I come across and that I can only guide by asking more questions. What is wrong with your home now? Are there five people using your only bathroom? Is your home falling apart at the seams? Is tile falling off the shower walls? Are the appliances the same age as your home steam is starting to warp the cabinets above your oven? Are your energy bills over $400 a month? Are you embarrassed when everyone squeezes into your kitchen and you are constantly shuffling around? Do things fall on your head from above of the refrigerator when you open it because the cabinets above are unusable? If you said yes to any of these, or perhaps you have another problem, then maybe remodeling is right for your home, but is it right for you and your family? This, unfortunately, is something that can really only be evaluated by you even when you get professional assistance from an interior designer, contractor and or realtor. What is the value of your home now? Even just a guess. How does that compare to what you purchased it for? Would you make, break even or lose money on selling now? Do you like it, do you have kids and are in a "good" school district? If you moved would your kids need to change schools? How much more would another home cost? Would it already be remodeled or would you need to do upgrades before you moved in and essentially carry two mortgages until you did? Have you talked with a realtor? What did they have to say about your home now? Do they think you would need to remodel it to sell at the "zestimated" value? Do you like anything about your current home? Would moving simply make all of your problems disappear? 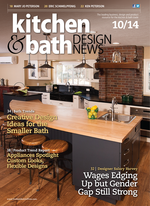 Have you had conversations with a remodeling professional like a kitchen and bath designer or a general contractor? What is the ballpark range of remodeling costs for your area? Would it be more or less than the cost of moving including realtors/movers/staging fees etc? Weigh out the pros and cons. Remodeling isn't for everybody. Maybe living in your home during construction would aggravate your child's asthma. Maybe the cost of living in a rental during construction is beyond your investment capabilities. What are you willing to invest in time as well as money? I recently met with someone who wanted to discuss remodeling their kitchen. They don't have a dishwasher and they enjoy hand-washing their dishes. They're not too happy with their new neighbors so they've started thinking of selling their flat in the next year. So should they remodel for the sake of having a dishwasher for resale even though it would involve new windows, electrical upgrades, and some major rework to their current space to maximize efficiency? They live in Berkeley and are in a great school district and family oriented neighborhood. Honestly, because the dishwasher is not an issue for them, and because the kitchen would most likely be remodeled by a new homeowner I recommended a different approach. What if we could "remodel" their kitchen for less than %1000? What if they did some minor handy-man work to improve the general cluttered feel of the space and we did a Schematic Design to provide the realtor with a hand-out to show the hidden potential so that they could make the space work for their personalities? Sometimes moving instead of remodeling is the right option. What Size Tile Should I use? Should the tile on shower walls be bigger than bathroom floor tiles? There are no real rules regarding tile sizes. Ultimately, the tile on the floor should be less slippery, and if you do a standard drain in the shower you will have fewer cuts if you use something that is 4" or smaller. Linear drains have really opened up the possibility of using larger tiles on the shower floor because you can now slope the floor in one direction instead of from all four corners. As far as aesthetics, go with your gut. When you are looking at tiles in the showrooms and on displays and even on Houzz, do some comparisons to see what you ultimately like. For instance, if you are doing a traditional bathroom, do you like a smaller "octagon and dot" or a "basket weave" pattern on the floor with a rectangular "subway tile" on the walls? Or do you prefer a larger square tile on the floor set in a diagonal pattern with the subway tile instead? Helpful hint: for a small bathroom, try to avoid using a tile that is approximately 12" x 12". Whether you are conscious of it or not, it is a size we are all accustom to; for example most of us look at and hold 8.5 x 11 paper daily and it is almost the same size, it becomes easy to tell and feel if a room is small. I recommend using larger tiles like 12" x 24", 18" x 18" or smaller tiles like the "basket-weave" pattern in this small bathroom in Berkeley or even simply having the 12" x 12" tile installed on a diagonal or off-set in a "cobblestone" pattern.